Taika by Poonam Bhagat - Page 2 of 2 - TAIKA by Poonam Bhagat, established in 1991, covers the entire gamut of women’s prêt-a porter from western to fusion to Indian silhouette. TAIKA , established 1991 , means “magic” in Finnish. Stringent quality control and emphasis on styling , color coordination and impeccable embroidery techniques have helped us create a niche for ourselves, sustain it and grow from strength to strength. The look is that of understated elegance. Ensembles that do not cry out loud but ,softly yet surely make their presence felt. TAIKA covers the entire gamut of women’s prêt-a porter from western to fusion to Indian silhouettes. Churidar-kurtas, tunics and sarees form the matrix of our Indian designs. Lehngas are far and few between and only made to order . Western wear encompasses all that is considered western ! But we have a special fondness for skirts in every conceivable form. Wrap, billowing, gathered, balloon, cocoon, sheath, tube, layered. From just below the thigh to just above the ankle ! Handpainted, appliqued, embroidered and textured in myriad hues . Quilted jackets are our strongest point. In vivid silks, contrasting or monochromatic with intricate quilting in abstract designs. Various silhouettes and lengths vie with each other ,all coming up tops. Very dramatic abstract patchwork appliquéd and then quilted over are also very popular. Fabrics used are natural pure fibres and usually handwoven.India is a veritable treasure trove of textiles so why not dip into it and pull out the best? Tawny tussars, matka silks, khadi, gossamer chanderis, crisp cottons, linens and raw silks are used to create a rich and fine tapestry. Pure georgettes , chiffons and crepe-de-chines are dip dyed for those who prefer a more flowing and ethereal look. Machine and hand embroideries are often combined to produce an old antique burnished gold look. We also use a lot of surface textures like pleating, tucking, blanket stitching, dori work etc. We do our own printing as well which is again combined cleverly with minimal or discreet embroideries .Colors are vibrant, but not jarring and the palette changes from season to season , sticking to tones that suit the Indian skin. Mints, leaf greens, limes, lemons, peaches , watermelons, cucumber greens dominate spring giving way to ivories, ecrus, whites and broken whites, bouncing back to rusts, oranges, yellows , aquas in autumn and going deeply passionate in the winter where we find purples, egg plants, burgundies, claret reds, midnight blues and indigos making their appearances. TAIKA sells across the country from more than 20 designer boutiques including Aza , Ensemble , Melange, Elahe , Evoluzione, 85 Lansdowne , Elan , Ogaan , Mogra , Amethyst , Collage Chennai, Collage Bangalore and Ffolio among others . We supply online through PerniasPopUpShop, Carma Online, Aza Online and Ogaan Online among others. 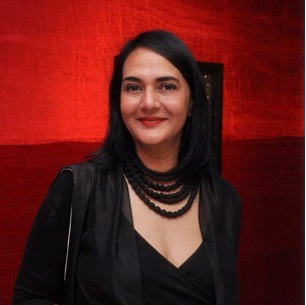 Poonam Bhagat is on the board of Governors of the Fashion Design Council of India , the Apex body for promoting the business of fashion .